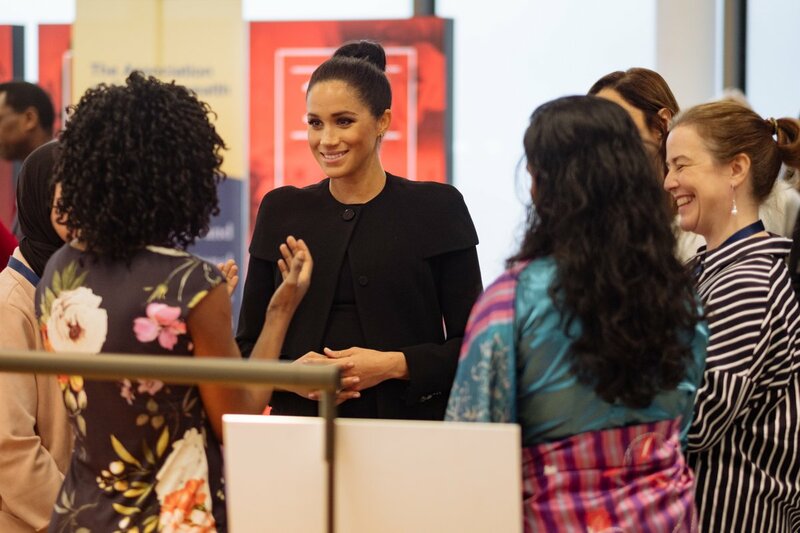 The Duchess of Sussex attended her second day of engagements this week, visiting the City University of London for the Association of Commonwealth Universities. Meghan wore an all black Givenchy ensemble for her meeting with students from across the Commonwealth whom are now studying in the UK. Meghan surprised royal fashion watchers with a very new and sleek hairstyle. The Duchess wore a Givenchy black cape coat. If the coat seemed familiar you are correct: we first saw Meagan wear this coat for her first Remembrance Day service standing on the balcony at the Cenotaph. We only got to see half of the coat on this day. The expertly tailored, collarless, front button coat has long sleeves with what appears to be an in built caplet over the sleeves and rear of the coat. Each sleeve ends in four buttons on the cuffs, with welt hip pockets and reaches a midi length. Meghan wore what appeared to be a Givenchy jumper and a pleated asymmetric hem skirt underneath her coat. However, some believe that Meghan’s outfit is a dress. We are not sure, as it seems like separates to us. The black crêpe de chine accordion-pleated skirt is actually a very interesting piece. The construction of this piece is quite unusual, with an asymmetric draped hem at either side and a layered tier halfway over the midi length skirt. We show two pieces that we believe were the inspiration for Meghan’s skirt. The first is from Givenchy Spring Ready-to-Wear 2018 Collection and the second is a mustard skirt from Givenchy Fall Ready-To-Wear 2018 Collection. The hem of the skirt from the spring collection almost appears to be shredded into many pieces. The Duchess’ appears to be less so and longer in length than the runway piece. You can really see the detail of the tiered skirt from the red version of the same black pleated skirt dress from the Spring Ready-To-Wear 2018 collection. Meghan is wearing a simple relaxed fit black jumper over her skirt. It is almost like a sweatshirt. We show below a jumper and pleated skirt style from Givenchy Pre-Fall 2019. You can get the look with this pleated skirt here. Meghan wore her Manolo Blanik ‘BB Pumps’ in beige suede. These pointed toe stiletto heels have a height of 100mm or 4cm. They are unfortunately no longer available to purchase. Try these for a great cheaper option here and here. Meghan accessorised with her Dean Davidson ‘Signature Midi Knockout Studs’ in rainbow moonstone inlaid in 22kt gold over brass. We saw their debut just over a week ago. These earrings retail for £114 and you can purchase these earrings here. Try these earrings to get the look for less here. Meghan also accessorised with a Catbird NYC ‘Threabare Ring’ and a gold bracelet. Very surprisingly Meghan did not carry a clutch or small top-handbag as she so often does. We absolutely love Meghan’s sleek and modern top knot hair style today, very chic and almost our favourite hairstyle she has worn.